​​This is not rocket science; it's common sense. 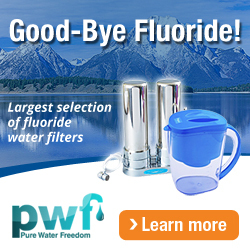 And, unlike the fluoride in drops, tablets, and tap water, fluoride toothpaste is actually FDA approved. However, make sure to read the poison label that FDA requires on all tubes of fluoride-containing toothpaste: "If you accidentally swallow more than used for brushing, seek professional help or contact poison control immediately." So — how many glasses of water, tea, coffee or other tap-sourced beverages do you drink in a day? If you're starting to feel a little uneasy — you should be. We all should.